I have a new obsession and it comes in the form of buttons. And not just any old buttons. 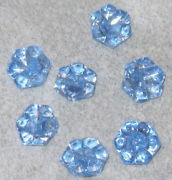 I was recently in a bidding war on eBay for a set of seven blue glass buttons. Weren't they a gorgeous color? I found them by way of another listing for a set of 10 pink glass buttons I had been eyeing that were for posted by the same seller. Unfortunately, I was outbid on the blue, but I certainly made her pay for them! I did manage to walk away with the pink ones and I am anxiously awaiting to receive them in the mail. Whether or not they are depression glass is debatable, but I do have faith that they are authentically vintage. So what am I planning on doing with said buttons? I haven't the slightest idea. I just know that I'm spending way too much time scouring the web for vintage glass buttons. I'm fairly certain I'll be making a few more button purchases in the near future, but for now I'll just be not-so-patiently waiting for my newest purchase to arrive and trying to figure out what clothing item I have that I can swap the buttons on!